You heard it right here — white jeans are now officially cool as a men's fashion item. Once the province of women, and confined to wearing in the summer months, white denim has now become a staple wardrobe item for stylish men who want to show off their fashion cred. We've combed through best of men's street style, to pull together this round-up of our favorite looks with white jeans for men, for every season of the year. Here's a foolproof way men that can wear wear white jeans to work this spring to look stylish for denim-friendly days, while still looking professional for meetings and presentations. Relaxed fit, straight leg white denim jeans become instantly office-appropriate when paired with a classic tweed jacket, a collared shirt and tie. Make sure your jeans are spotlessly clean and dress up your look with impeccable personal grooming, and spotless loafer-style shoes. Men are often challenged by what to wear for a casual date. Here's an outfit that strikes the perfect balance between looking like you made an effort to dress well, while conveying a laid-back, confident style. For a stylish, masculine outfit that will impress your dates, pair belted, white denim jeans in a classic straight-leg fit with a Indiana Jones-inspired khaki bomber jacket, layered over a dependable blue button-down shirt. To really put that first impression on lock, make sure your accessories convey quality, as in the classic aviator sunglasses and cool leather sneakers pictured here. Get in on the athleisure trend, and stay comfy and warm for fall and winter days, by wearing a hoodie with a go-to pair of men's slim white jeans and easy sneakers. To avoid looking sloppy, you can tuck in the front of your sweatshirt to your waistband, as pictured. Another great trick for upgrading your casual weekend outfits, as seen here, is to layer a long camel trench coat over top. So easy! Dressing warmly and comfortably for fall and winter casual days doesn't have to mean skipping out on style. As seen here, a pair of winter white jeans is a fresh option for winter weekends. Roll up the cuffs for a stylish look, and pair them with a cool bomber jacket and sneakers. A geometric patterned scarf and a snug knit beanie hat add masculine style, while protecting you from wind chill. White jeans can look dressier than blue jeans, which makes them a great choice for the office in spring and summer. Start with a pair of clean, ironed white jeans in a straight-leg or slim (but never tight) fit). 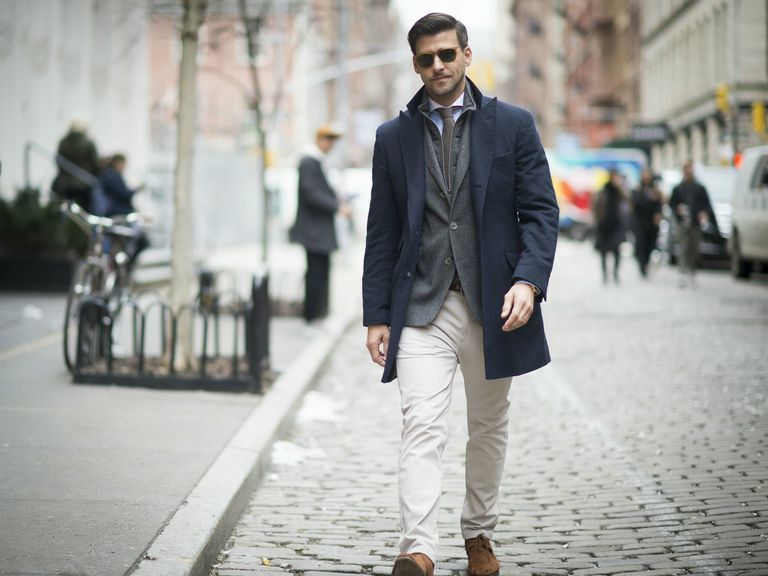 Add a white t-shirt, then layer on a crisp, lightweight blazer in dark navy -- cotton or linen are good choices. Finish your work outfit by adding the right accessories -- a red pocket square, leather briefcase, and grown-up footwear (no plastic shoes) will do it. 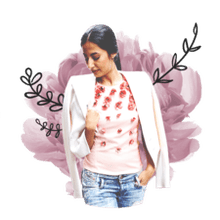 If getting dressed for casual weekends usually means pulling on whatever jeans and t-shirt are clean, you can instantly up your fashion game this spring and summer, simply by swapping your usual blue jeans for white denim. Pair your relaxed white jeans with a white t-shirt, for a summery outfit that will have you looking casually stylish, even with minimum effort. (Score). Want to look more intentionally styled? Dress to impress by tying on a black scarf or bandana at the neck, and/or adding a straw fedora (just know how to eliminate hat hair). Military-style jackets are a men's fashion trend that seems to come back every season. Men looking to upgrade their fashion game in white jeans can pair an army-inspired, olive spring jacket -- with or without patches and badges, as pictured here -- with a tapered or straight leg jean in white denim, as pictured here. Men looking to create casual outfits for travel can mix things up by packing a go-to pair of slim, white denim jeans. We like the way this trendy jean for men matches with a classic denim shirt, for a double denim look that always looks good on vacation. Style it belted with a tucked in tee, and wear your denim shirt open, as pictured. Or, button up your shirt and leave it untucked for a more classic look. If you do the latter, just be sure the shirt fits your upper body well, so you don't give a sloppy impression. When you're a guy meeting up with someone new for coffee or drinks, you want to look pulled together, without looking like you spent hours planning your outfit. Strike the perfect balance in a casual date outfit of a dark jacket and slim white jeans for men. Wear with ankle boots or sneakers, and a confident attitude. The scarf pictured here is optional -- while it looks fashionable, wear it only if your personal style (and the weather) suits. On transitional weather days, when it's neither hot nor cold, you can keep warm and look cool for casual occasions in layered outfits with jeans. Here, slim white jeans and a long, neutral colored sweater worn over a collarless shirt look ready to take you through your weekend, from lunch with friends, to long walks outdoors, and casual get togethers. Men who care about looking trendy can have fun with distressed denim styles for men. Ripped white jeans -- whether lightly abraded at the knees, or shredded right through the legs and hems as pictured here -- are a great choice for wearing for casual weekend strolls, grabbing a coffee with a friend, antiquing, or to class. As the weather gets warmer, men can transition their weekend style to look stylish by trading their blue jeans for white denim pants. A slim, straight-leg white jean and a t-shirt is an easy weekend uniform for spring and summer. Dress it up for city strolls or afternoon meet-ups by choosing quality accessories, such as wearing leather loafers instead of sneakers, quality sunglasses, or a great watch.